I’m guessing this would be be the place to ask this. I wear my tumbo’s and victory’s sockless for racing and training (depending on the session) as they fit way better and anyone who wears socks with them is pretty much branded a tool. 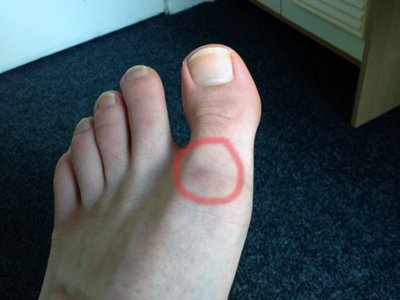 Only issue is I get horrific rubbing on top of my foot at the base of my big toe (especially with the tumbos). Pretty much annihilated my feet in an easy 5k at the weekend. Is there any way to stop it i.e. Vaseline (petroleum jelly) or am I just gonna have to spend a fortune on anti blister band-aids (compeed)? It is from the little circles of tougher material used for the lace holes. I just put two pieces of 3M Micropore tape on top. I doesn’t cost that much and the roll seems to last forever. Depending on how bad it is, bodyglide might work. It won’t stop something from slicing your foot open, but other than that it can do pretty much anything. You won’t get blisters if you’re wearing bodyglide. Thanks, but they don’t have a size 10 any more. Any idea where else I could get them? I wear Size 11 Matumbos and they fit pretty snug. What size do I need in original Vics? I’ve been reading that they fit large and that I need 10.5, is that correct? size 11 would probably work fine… I think that 10.5 might be a bit tight. I wear 10.5 matumbos and 10.5 vics. my vics and matumbos have always been the same size and fit more or less the same, so 11 should be right. I have the og mambas in size 11. A have few spikes in 10.5 but the mamba is a snugger fit compared to the vic and matumbo, I would go with an 11.
how do vic elites fit compared to OG victory track spikes, matumbo, and mamba? In my opinion, slightly larger. My size 10 vic 2’s and vic elites fit about the same as my 10.5 og vics/matumbos/mambas. (maybe the tiniest bit more snug for the vic 2’s/elites). Has anyone tryed on a pair of flyknit frees? How do they fit compared to your usual nike sizing? I assume they will be quite tight so maybe go up .5? Probably won’t get much response before 8/1 which is the hard release date for many running stores. How is the sizing on OG Vic XC’s? Is it the same as OG track Vics and 'Tumbos? I’m a snug, tight (sz.9) fit in OG Vics and 'Tumbos. Should I go with size 9 in the OG Vic XC or go up to 9.5?